The Lower Modernisms – 007. Matchbook Delight! 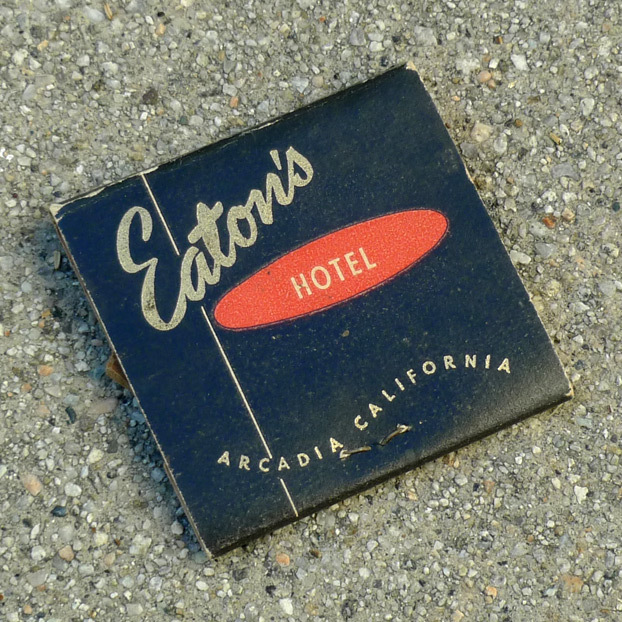 Part 2, Eaton’s Restaurant and Hotel, Arcadia, Calif.
February 23, 2011 by James Black. Today’s installment of Matchbook Delight! features a book from Eaton’s Restaurant and Hotel, formerly of 1150 West Colorado in the city of Arcadia – part of Route 66. A little internet search-engine research helps us find a historic postcard of the Eaton’s site, a sprawling roadside rancho with a googie-izing sign out front and a long drive-in bay for carhop service added out back. There is now a much later Coco’s coffee shop on this site. Eaton’s could be reached at Murray 1-6033. 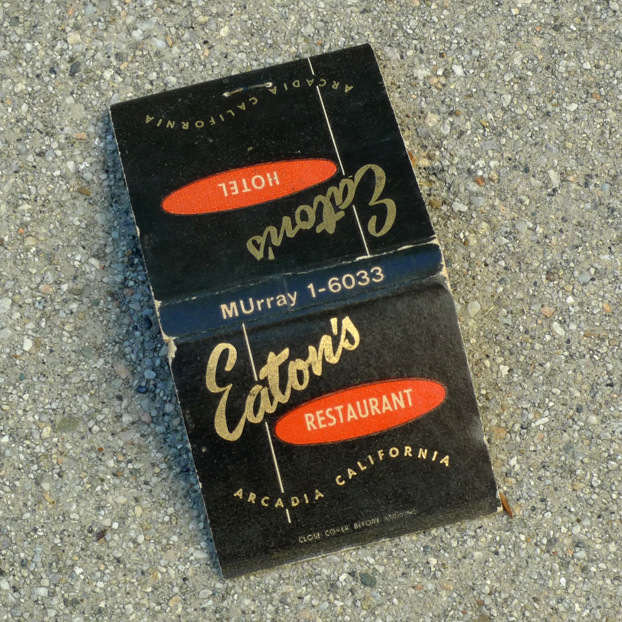 According to Wikipedia, most areas had fully adopted all-number calling by the late 1960s, so this matchbook could be from the early 1960s, which is what I would guess based on its handsome looks. The style of the matchbook seems a little at odds with this reality – printed in red, gold and black, the book strives toward an elegance of the cocktails-dinner jackets-nightlife type. The photo doesn’t quite do justice to the sparkly metallic gold ink. The design is deliberately asymmetrical and jaunty. The fine vertical line divides nothing, but is there strictly to reinforce the asymmetry. The “Eaton’s” in script is set at an angle, carefully located in relation to the corner of the book, the vertical pinstripe, and the red oval. “ARCADIA CALIFORNIA” is twisted into a kind of sinusoidal wave for no reason other than to look cool all day. The combined effect of “Eaton’s” and “ARCADIA” interrupting the stripe creates the suggestion of signage elements cantilevered from a vertical signpost; the curve of “ARCADIA” around the stripe suggests a revolving around that axis. The red oval has great proportions. If you look closely at both sides of the book, you can see that the stripe intersects “Eaton’s” and “ARCADIA” in different places on each side.